I was about eight years old and that question required a little bit of thought. I knew from watching Road Runner cartoons that whenever the coyote is carrying a case of Acme lead off of a cliff he falls faster than the lead so that it lands on top of him after he hits the ground. This made me think that lead must be lighter than a coyote. Your kid’s science teacher is sure to give him an “A” if he wears this shirt. While my eight year old mind was mulling over the ramifications of heavy feathers I suddenly realized its a trick question and the unspecified quantities are the same weight! This spurred me on to read about Galileo and Newton and take lots of physics classes in school. In case you’ve forgotten, Galileo was the guy that dropped cannonballs off the leaning tower of Pisa and Newton was that guy that had an apple fall on his head – or so the legend goes. Eventually science figured out that all objects, no matter what they weigh, drop at the same rate of acceleration – 9.8 meters per second squared, which is a useful fact but has nothing to do with the trick question. 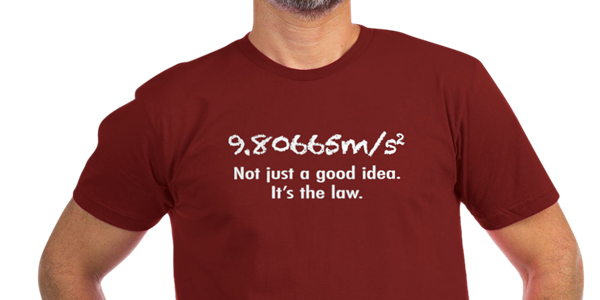 So that’s the story behind my t-shirt design about the law of gravity. It would be a great shirt to have your kid wear to school if he wants the teacher to think he loves science. 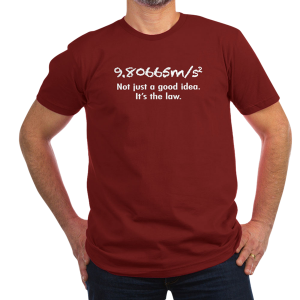 You can find it here on CafePress and here on Spreadshirt. As a special incentive, Spreadshirt is offering free shipping until August 19th. Use the voucher code SHIPLESS. Cannot be used with other coupon codes or gift certificates.